Assam: Gandhi Fellows of Piramal Foundation busy 'transforming' schools in Baksa! Assam: Gandhi Fellows of Piramal Foundation busy ‘transforming’ schools in Baksa! 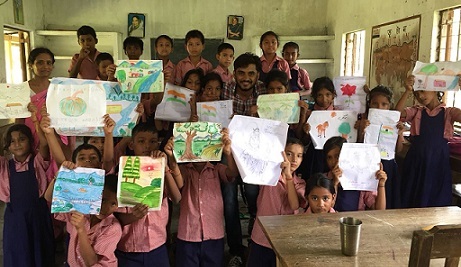 As part of the ‘Transformation of Aspirational District’ Programme, the Gandhi Fellows of Piramal Foundation have been working for transforming schools in Tamulpur Block of Assam’s Aspirational district of Baksa. Under the ‘Transformation of Aspirational District’ Programme, NITI Aayog and Piramal Foundation entered into a Statement of Intent (SOI) in March 2018 to work closely with the district administration and other stakeholders of education on the identified NITI Indicators (KPI). Piramal Foundation for Education Leadership, a part of Piramal Group has been engaged in designing and providing leadership solution to major obstacles in the improvement of education in India. At Baksa district, Jagdish Bishnoi, a Gandhi Fellow of Pramal Foundation has initiated BaLa (Building as Learning Aid) and ‘Learning Corner’ with the help of school staff, community and district officials to improve learning outcome of the students in Tamulpur’s two selected schools. In Tamulpur Block, Gandhi Fellows have worked hard to gather community support for development of the schools through fostering ownership and have indeed received tremendous response on successful participation of school management committee, guardians, and other members of community in rolling out donation driveshaft. On September 1, 2018, as a mark of the commencement of ‘Swaschata Pakhwada’, the community members were seen engaged in cleanliness drive in 182 LP School, Barkhopa, where the people came forward to lend support to the school staff in clearing the ground in the school premises.